It is a specialized area that conducts medical treatment for all the tissues that make up the movement organs, that is, diseases and injuries such as bones, cartilage, joints, muscles, ligaments, and nerves. 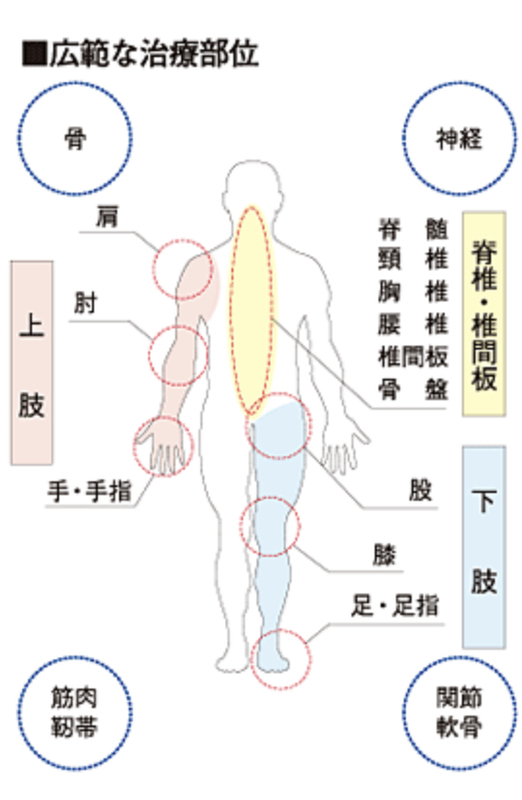 The subjects cover the spine,spinal cord, pelvis, upper limbs (shoulders, elbows, hands, fingers), lower limbs (crotch, knees, feet, toes) and so on. It covers all age groups from newborns, children, school children to adults and the elderly, and its contents are diverse, and the number of patients requiring treatment is extremely high, which is characteristic of orthopedics.